Here's a piece of news that hasn't been receiving much attention but is quite interesting; it's about a Romanian team called ARCA that competed for the Ansari X Prize in 2004. 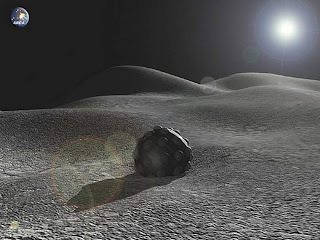 Since then Google has come out with its own prize (Google Lunar X Prize), offering $20-$30 million for a team capable of sending a craft to the surface of the Moon, moving at least 500 metres and then beaming images back from the surface. This team has an interesting proposal: first they will send a balloon up to an altitude of 18 kilometres, after which a rocket will send the craft into low-Earth orbit, after which the lunar craft will separate and make its way to the Moon and then land using its ball-like shape and some rockets to slow its descent as well. Whether it succeeds or not, the data gathered from a balloon-based launching platform will be interesting, as this has been proposed by many others as well. CU Spaceflight for example is aiming for this as well.